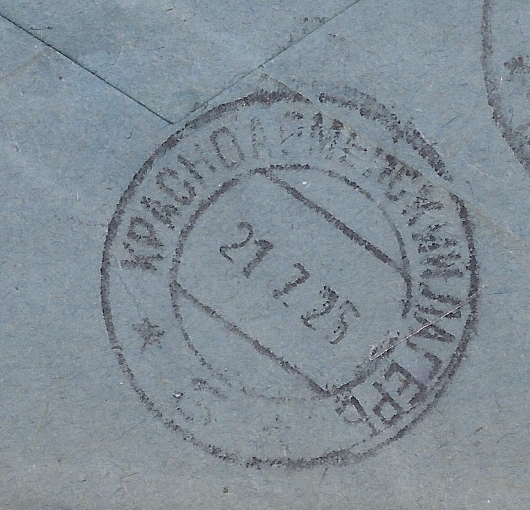 For the Civil War period, ending 1921, it is possible to find mail endorsed "Red Army". This includes Free Frank mail from soldiers to their families and also franked Parcel Cards sent at reduced Red Army tariffs and originating from loot sent home by soldiers on active service. 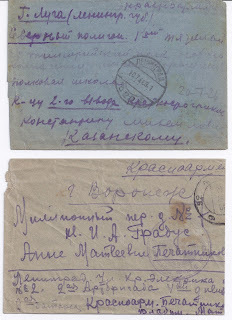 But after the Civil War, I don't think I have seen 1920s Red Army mail until I came across these two stampless items. The first is going from one military address to another in Luga. There is a LUGA LENING[rad] receiver cancel of 23 7 25 on the reverse but also an interesting KRASNOARMENSKILAGER [ Red Army Camp] 21 7 25 cancel - I have enlarged this above. On the front there is an endorsement "Red Army" at top right and also on the front is a LENINGRAD 20 7 25 civilian cancel. 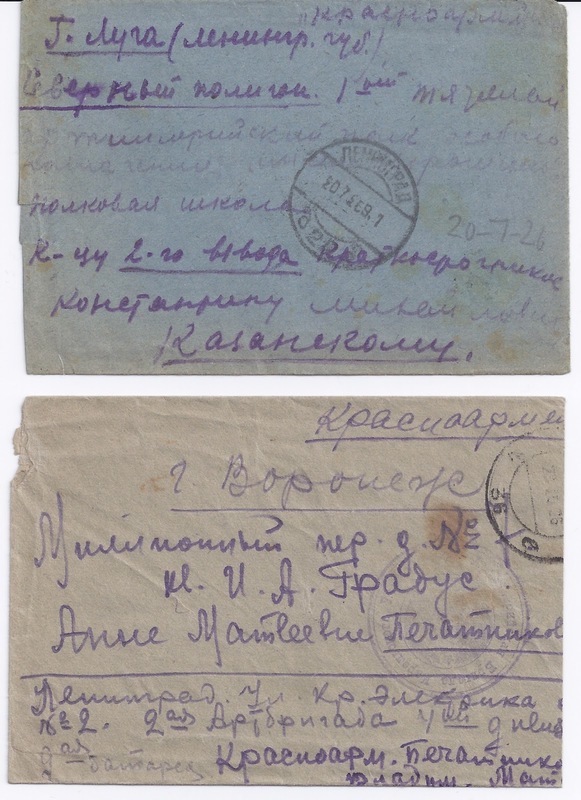 The second is family correspondence from a soldier, Pechatrikov, in Leningrad sent to Voronezh - on the reverse is a VORONEZH 25 10 25 receiver cancel. This letter is also endorsed "Red Army" top right and below it there is a violet Free Frank seal. The part cancel to the right with "36" at the base is almost certainly a regular Leningrad postmark.